We first visited the Publican House on a trip up north to visit a dog we were hoping to adopt. His name is Dastan and he is the best horse sized poodle we could have hoped for. We also enjoyed the beer. The Square Nail is a beer inspired by all the nails lying around when the owners of the brewery first renovated the building. They dropped a can off for us to enjoy and we must say we certainly did. They describe the beer as a west coast pale ale. This tells me it should be well balanced and a bit on the fruitier side. 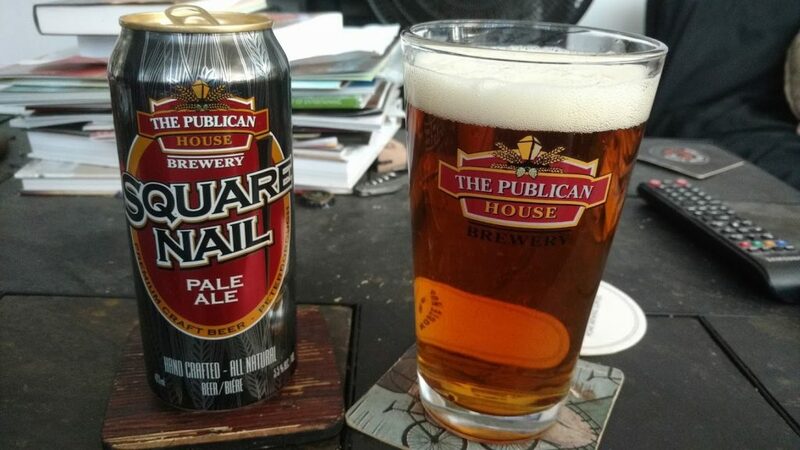 You can purchase Square Nail at the LCBO for just $2.90 and it sits at 5.5% ABV. Appearance: Golden brown, pure white head that stays. Aroma: A bit metallic but mostly lightly toasted malt. A bit of mango. Taste: A bit of pineapple and mango mixed with some pine needles. Aftertaste: Short, dry and wonderful. Overall: A good pale ale, nothing too exciting. Have with chicken.